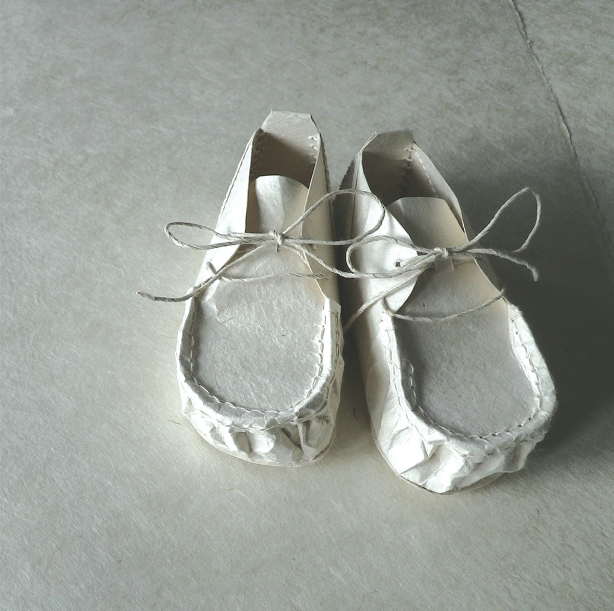 Today, I would like to introduce these unique baby shoes, “Kami no Kuni Kara Kami no Kutsu” made of traditional Japanese ‘washi’ paper. The name of the product literally means “paper (= kami) shoes from the God (= also kami)’s land”. Well, these shoes are made by a ‘washi’ paper company called Kawahira based in Shimane prefecture, in which can be found the Izumo Taisha Shinto Shrine where all the Shinto gods and goddesses gather. Sounds mystical, doesn’t it? 🙂 The unusually durable washi paper used for these shoes is produced using the traditional handmade technique called “tamesuki”. “Kami no Kuni Kara Kami no Kutsu” are made out of 100% non-dyed and unbleached washi paper. Even stitching threads are made from washi paper as well. These shoes are an amazing creation. The price is ¥18,000 (tax excluded/ US$224). Somewhat expensive…but don’t worry! There are also DIY kits to be had for only ¥6,000 (tax excluded/ US$75). According to Mr. Kawahira, these shoes are produced for infants around one-year old who have just started to stand up and walk. These shoes are good and strong enough for actual use, and also great for preserving memories.